During these test periods and in a light laden condition, the crew observed the vessel capable of speeds in excess of 45 knots, over 50 mph. 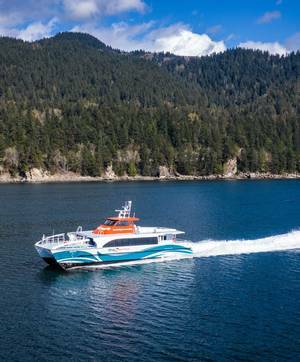 The vessel was designed by Teknicraft in Auckland, New Zealand and will operate on Kitsap's current cross-sound ferry route between Bremerton and downtown Seattle. The successful launch of the Reliance will provide Kitsap Transit with a back-up vessel on the BremertonSeattle route. A third sister ship vessel, Lady Swift. is currently under construction at AAM and will launch in summer 2019. "Reliance is not your typical ferry, it was built to be very lightweight and to fly smoothly through the wake sensitive zone," explains Matt Mullett, CEO for All American Marine. "This vessel was strictly modeled on the proven hull design, but additional enhancements and modernizations were added without hampering performance." The 78' Reliance was designed to mirror the Rich Passage 1, with a few upgrades. The vessel will also carry 118 passengers and has registered a service speeds of 37 knots. The addition of air-conditioning units and an improved HVAC system will improve airflow to help reduce cabin temperatures during the summer.